Facility managers looking to expand their laboratory's compounding capabilities without incurring extra infrastructure expense need look no further than the Purair® RX. 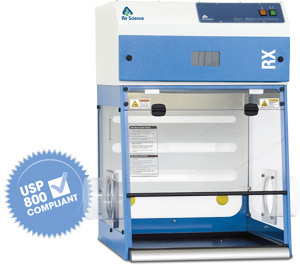 The Purair RX Balance Hood is a Class I enclosure that meets USP 800 requirements for non-sterile compounding procedures and is designed to protect the user and the environment from hazardous powders and particulates generated on the work surface. The Purair RX is also a standalone ductless unit that can be integrate into an existing laboratory without additional ductwork or utilities requirements. The Purair RX complies with USP 800 guidelines which specify hazardous materials must be compounded within the proper work environment associated with both sterile and non-sterile products and preparations. Air Science recently published a whitepaper discussing the USP 800 requirements and product designs that meet the standards. Download the whitepaper here. For additional information on the Purair RX Balance Hood, call, visit our product selection page, or email Air Science today.